Dealing with the hawkish president won’t be easy for Moon, who seeks renewed peace efforts with North Korea. South Korean President Moon Jae-in, who swept to power in May elections after promising to defuse tensions with North Korea through diplomatic, economic, and cultural engagement, arrives in Washington on Wednesday, June 28, for his first meetings with Donald Trump and his hawkish national-security team. Many Koreans hope the summit will clear the way for Moon to move ahead with his efforts at peace-making, which he has modeled on the “Sunshine Policy” adopted by South Korea’s last two progressive presidents, Kim Dae-jung and Roh Moo-hyun. According to a recent poll, nearly 80 percent of South Koreans support the renewal of dialogue with North Korea, which lies just 30 kilometers north of the capital, Seoul. 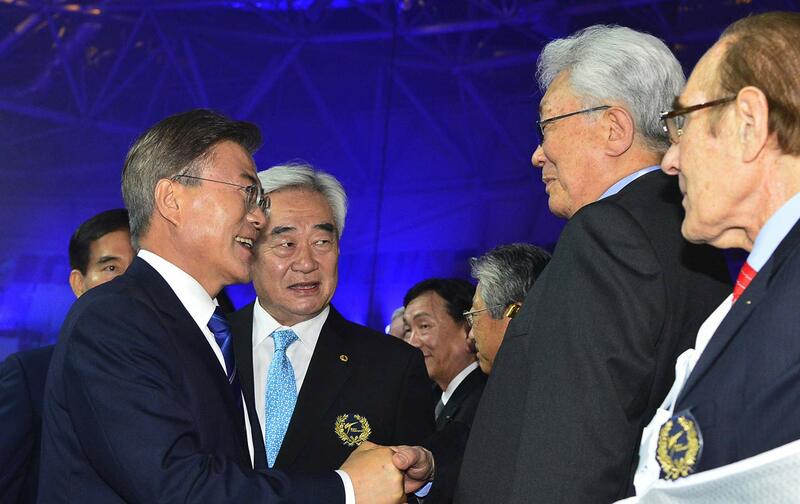 In a sign of what’s to come, President Moon last weekend welcomed a delegation of North Korean athletes to the World Taekwondo Championships in Muju, South Korea. He used the occasion to propose that North and South Korea form a unified team to compete in the 2018 Winter Olympic Games, which will take place in the South Korean city of Pyeongchang. “Sports are a powerful tool to demolish walls and separation,” Moon declared. Two weeks ago, Moon drew Trump’s ire when he ordered a delay in US deployment of the THAAD air-defense system. But the new president, who spoke to The Nation in an exclusive interview two days before his election, is likely to face stiff resistance to some of his ideas in Washington at a particularly volatile time in US-Korean relations. Two weeks ago, Moon drew Trump’s ire when he ordered his government to delay US deployment of the Terminal High Altitude Air Defense system, known as THAAD, until it conducted a full environmental review. THAAD has been the subject of fierce protests from residents in the rural town of Soseong-ri, where the first batteries were set up with the blessing of former president Park Geun-hye, who was impeached in March and later arrested for corruption and abuse of power. On June 24, several thousand demonstrators chanting “No THAAD, No Trump” gathered in downtown Seoul and later circled the US Embassy to demand THAAD’s immediate withdrawal. The discussions won’t be easy, however. Last week, US officials were seething over North Korea’s treatment of an American tourist, Otto Warmbier, the Virginia college student who was imprisoned for 17 months by the Kim Jong-un government and suddenly returned to the United States in mid-June in a coma. He died a few days later, sparking emotional denunciations from the Trump administration and Congress, which in response may soon pass an outright ban on US citizen visits to North Korea. “North Korea has to be held accountable,” Representative Rob Portman, the Ohio Republican, promised CNN after Warmbier’s funeral last Friday. “There will be more of that later.” Christopher Hill, a former high-ranking diplomat who led the US delegation to the six-party talks with North Korea from 2005 to 2009, took to The New York Times to oppose further visits by Americans. “Given the danger to United States citizens in the country, it is time to take the unusual step of imposing a ban,” he said. North Korea, according to the Associated Press, was aware of Warmbier’s condition a year ago and failed to relay the information to the US government during months of sporadic negotiations about him and three other Americans being held by the North. But while the student’s doctors dismissed North Korean claims that his coma was induced when he contracted botulism and then took a sleeping pill, they did not find any evidence of brutalization or torture. “When asked whether [the brain damage] could be the result of beating or other violence while in prison, [doctors] said that Warmbier did not show any obvious indications of trauma, nor evidence of either acute or healing fractures,” The Washington Post reported. Bill Richardson, the former New Mexico governor who has helped get several prisoners released from North Korea, told NPR that Warmbier was probably the victim of an interrogation that went wrong. “It affected his brain [and] he then went into a coma,” he said. “I don’t think they’re foolish enough to engage and torture a 21-year-old boy who just stole a political banner.” In any case, US activist groups seeking to end the standoff through dialogue and engagement expressed hope that Congress would not ban US citizens from visiting North Korea. That idea has currency in Washington. On Monday, at the same Seoul forum where the foreign minister spoke, James Clapper, the former director of national intelligence, proposed that the United States and North Korea establish interest sections in each other’s capitals to “help prevent miscalculations stemming from a lack of communication” and establish conditions for direct negotiations, according to The Korea Herald. Yet even as President Moon was expressing sorrow and anger over Warmbier’s death, Moon and his foreign-policy advisers were portrayed by the US media as undercutting American policy. The coverage was epitomized by a visit to Seoul by CBS reporter Norah O’Donnell, who spent two years of her youth living with her Army family at Yongsan, the sprawling headquarters of the US military command in South Korea. Moon replied politely. “I have never mentioned a dialogue with no preconditions whatsoever,” he informed O’Donnell. “I believe that first we must vie for a freeze of North Korea’s nuclear and missile programs. And then, as a second phase, try to achieve the complete dismantlement of North Korea’s nuclear program. And I believe there are voices supporting such a step-by-step approach even within the United States.” He was referring to recent statements from former officials such as William Perry, who negotiated directly with North Korea in the 1990s as President Clinton’s defense secretary. Two weeks ago, Perry made several appearances in Washington, where he said a North Korean freeze of its missile tests, combined with a reduction in US-South Korean military exercises, were ideas “worth considering” as a way to restart negotiations with the North. He also told a seminar on North Korea sponsored by the American Friends Service Committee and the Korea Peace Network that the United States should respect the Moon government’s wishes to remove THAAD, arguing that the system was of “little use” in defending against North Korean missile attacks. Even the RAND Corporation, long known for its hawkish stance on Korea, recently endorsed the idea of negotiating a peace treaty with North Korea to end the state of war. Clapper backs the idea as well. “At least engaging in discussions leading to a peace treaty would relieve [North Korea’s] fear of attack, and also deflate one of their major assertions they use to instill fear among their people to justify their grotesque commitment of resources to their military,” he said on Monday. Taking note of the shifting tone in Washington, The New York Times’s David Sanger reported on June 21 that the Trump administration “has come under growing pressure” to open negotiations on a temporary freeze of North Korean missile tests in exchange for reductions in US military exercises on the peninsula. But President Moon was clearly rattled by O’Donnell’s audacious assumption that he needed permission from President Trump to talk to the North. “Resumption of dialogue with North Korea may need to be pursued in close cooperation and consultation with the United States, but South Korea does not need to be allowed by the U.S. to do so,” Moon’s chief spokesman told Yonhap News, the country’s official news agency, within hours of his CBS interview. The public should expect similar fireworks during this week’s summit, predicted Christine Ahn, the founder and spokesperson for Women Cross DMZ. She recalled the disastrous 2001 meeting between the late Korean president Kim Dae-jung and former President George W. Bush, when she said Bush “humiliated” Kim by publicly rejecting his policies of engagement. “Like Emmanuel Macron [France’s new president], Moon should be prepared to push back,” she said.